"Hooray for flu season!" - No One Ever. And you know what else helps with those? 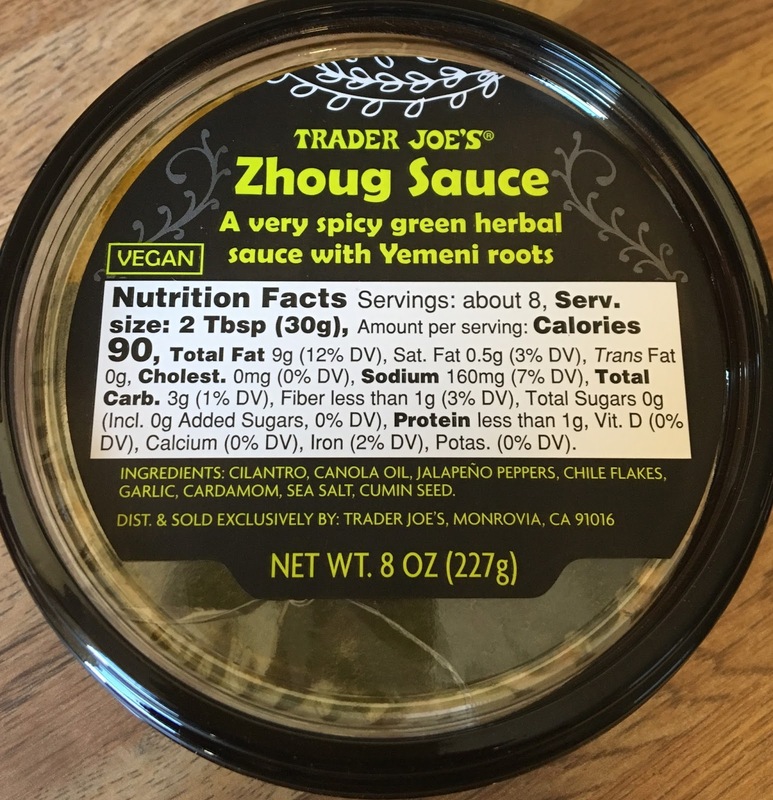 Trader Joe's Zhoug Sauce. Seriously. I'm not gonna sit here and purport to be any sort of zhoug expert. Heck, I don't even know how to pronounce it - zoog? zog? zawwwg? zowg? - and will admit it's my first go around. But apparently it's a pretty common concoction in Middle East cuisine - the package here says Yemen, some online sources seem to tie zhoug to more Israeli roots. Regardless, if I saw zhoug as a menu option somewhere I'd be reluctant to try it, but this TJ's take has me 100% on board with giving it a further try. 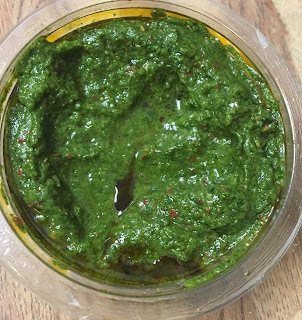 What TJ's zhoug seems most to me like is a cilantro pesto sauce with plenty of kick. That's really the other feel of the sauce - oily, herbaceous, and very, very green. No pine nuts or anything like that, though. It's not as overpoweringly cilantro-y as I thought it'd be, must be some conjuring in there somewhere. Beware though - it's spicy. And that's an understatement. It's sneaky, though. It might not be on your first bite. And maybe not til your fifth or so. But out of nowhere - BOOM. It will get you. If it's enough to get abrupt notice from me, it's potent as all get out. It hit me on the first shot, with subsequent bites not nearly as powerful. Not sure if it's the jalapenos or chile powder or what - it's not a distinct enough of a heat to attribute the sauce, it's just plain HOT. But yeah - that was a few hours ago at time at time of writing. And I'd be danged if my sinuses don't feel 100% better. Your mileage may vary. Sandy and I devoured on crackers as a dip, but I think this would be good on most anything. Our dinner tonight was shrimp and cheese raviolis - that would have worked. Eggs, chicken, other noodle dishes, rice, dips, in a wrap - yes to all of those. It needs to be a little more even to score higher, but as is, both Sandy and I are pretty happy to have dropped the $2 on the tub. Give it a try, it's nothing to sneeze at. We mixed this with yogurt to make a sauce for rice and beans--it reminded me a lot of a condiment I would have at the local Indian restaurant, actually. The yogurt also takes the spice down a bit and mellows the flavor overall. That sounds like an awesome idea! It’s a condiment at all the falafel shops and carts in nyc, so they ask if you want “green sauce” usually and a dribble will go on the pita sandwich with the “white sauce” (yogurt based”), sliced pickles, hummus or babaganoush, lettuce, onions, and either the falafel or whatever meat. It’s also popular for eggs, on bean based soups, and kebobs. I mistakenly said yes ONCE to this on my falafel pita and that was the first and last time, it’s seriously spicy!! I will definitely need to buy some of this. Might be good with some of Trader Joe's dumplings or garlic naan. So good on Trader Joe's Naan!!!!!!!!!!! This stuff is seriously SO good! But yes, I agree it is spicy! You can put this in soup to kick it up and add it to balela salad. I just hope its not too spicy and no one buys it and then they get rid of it! I made a salad dressing that was to die for. Made with hazelnut oil from Tourangelle, whole grain mustard, red wine vinegar, shallots, salt and pepper. Zhoug gave it just the right zing! As someone who eats a lot of spicy foods, I found it not spicy enough! It has a pleasant kick to it. Just used up the remainder of a tub with a "cook whatever is in the fridge meal": sausage meat, asparagus, peppers, spinach, scallions, garlic, puy lentils, green onion, and rice all sauteed together with a dollop of zhoug on top to serve. The zhoug made it a meal worth eating! How did it go with pasta? Thumbs up or down? I have not stopped buying a tub at every Trader Joe's visit since reading this article, thank you. I like spicy food, so it's no problem for me and my fiance and I put it on everything. Great stuff! I dip it side by side with hummus. Perfect combo.